Osteoarthritis (OA) is one of the most prevalent joint diseases, which causes pain and disability in the adult population. OA affects the osteochondral unit in the joints, which comprises both cartilage and subchondral bone. There has been some progress in understanding the changes in subchondral bone with progression of OA. However, local changes in subchondral bone such as microstructure or volumetric bone mineral density (vBMD) in connection with the defect in cartilage are relatively unexplored. To develop an effective treatment for progression of OA, it is important to understand how the physical environment provided by the subchondral bone affects the overlying cartilage. In this study, we examined the vBMD distribution in the OA joint tissues obtained from total hip replacement surgeries due to OA, using peripheral quantitative CT (pQCT). It was found that there is a significant decrease in vBMD, which co-localizes with the damage in the overlying cartilage. This was not limited to the subchondral bone immediately adjacent to the cartilage defect but continued in the layers below. Bone resorption and cyst formation in the OA tissues were also detected. We observed that the bone surrounding subchondral bone cysts exhibited much higher vBMD than that of the surrounding bones. pQCT was able to detect significant changes in vBMD between OA and non-OA samples, as well as between areas of different cartilage degeneration, which points to its potential as a technique for detection of early OA. Osteoarthritis (OA) is a degenerative joint disease, characterized by degradation of cartilage and changes in the subchondral bone. Patients with OA often suffer from pain, loss of mobility, and go on to require an end-stage total joint replacement. In 2015, 215,502 joint replacements were performed in England and Wales predominantly for OA (93%) (National Joint Registry for England, 2015). According to the World Health Organisation, 52% of people over 70 years old have OA. It affects around 400 million people’s lives, and this number will increase with an increasing aging population (Goldring and Goldring, 2010, Litwic et al., 2013). It has been predicted that the incidence of OA would be increased to 35% by 2030 (Thomas et al., 2014). OA affects both articular cartilage and subchondral bone. The degradation and loss of cartilage during OA stems from the decrease in the levels of proteoglycans and changes in biomechanics of the extracellular matrix, altering morphology and metabolic activity of chondrocytes (Martel-Pelletier et al., 2008, Maldonado and Nam, 2013). Radiologically, OA is characterized by the narrowing of joint space, osteophytes formation, subchondral sclerosis, and subchondral bone cysts are usually observed in advanced cases. In OA, thickness of subchondral bone comprising both subchondral bone plate and subarticular spongiosa is increased, mineral content is reduced, and trabecular structure is changed (Madry et al., 2016). It has been shown that bone mineral density (BMD) changes are associated with the progression of OA (Sepriano et al., 2015). Reliable methods to assess BMD have been attracting an increasing interest. Currently, dual-energy x-ray absorptiometry (DXA) and magnetic resonance imaging (MRI) are used to measure the BMD. However, MRI techniques are only able to provide an indirect measurement of BMD (Bennell et al., 2008). 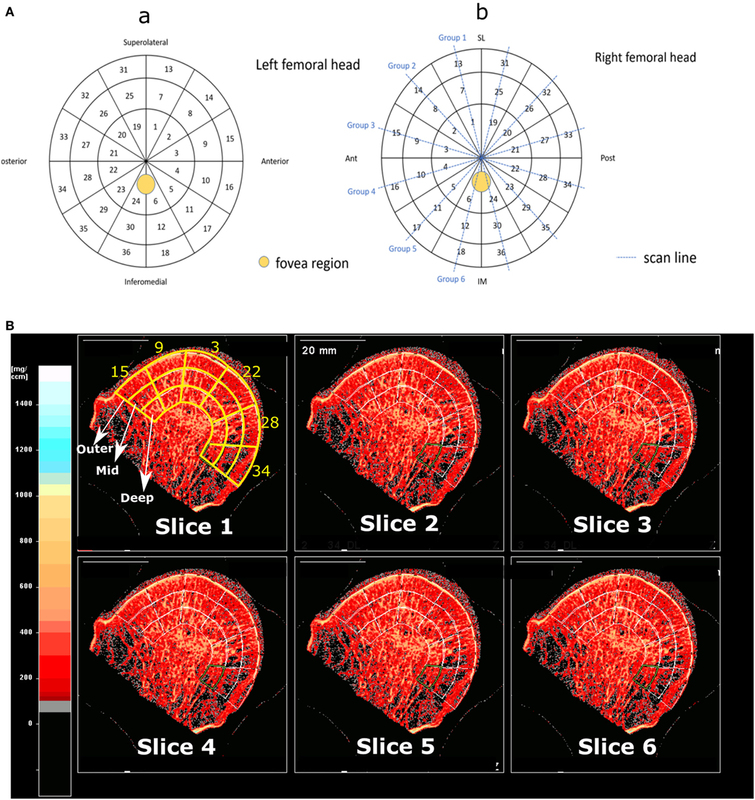 Another technique used for BMD research is quantitative computerized tomography (QCT), which utilizes an X-ray based device to measure BMD in three dimensional space (Adams, 2013). One of the advantages of QCT over the conventional DXA is that the volumetric bone mineral density (vBMD, mg/cm3) readings obtained from it, is independent of bone size (Bennell et al., 2008). Peripheral quantitative CT (pQCT) is a type of QCT that is increasingly used in measurements of BMD especially in peripheral regions of the body. Although BMD of the joint is positively associated with prevalence and incidence of OA, its relationship with the advancement of OA is not well understood (Lee et al., 2013). More so, scarcely data are available regarding the local changes in BMD with progressive degeneration of articular cartilage. The aim of this study was, therefore, to measure and compare the subchondral vBMD distribution in more advanced OA joints and correlate vBMD distribution with degeneration of overlying articular cartilage. The results would improve our understanding of the role of subchondral bone remodeling and resorption on the cartilage degeneration. Femoral heads of nine patients undergoing total hip replacement were collected at Royal National Orthopedic Hospital, approved by UK Health Research Authority (REC reference: 15/LO/2052). Inclusion criteria consisted of femoral heads which had been removed during arthroplasty due to clinically diagnosed OA (n = 7) or due to developmental dysplasia of the hip (DDH) (non-OA, n = 1). The non-OA sample is used as a reference for comparison in cartilage grading only. Exclusion criteria included excessive joint damage or deformation that prevented a successful analysis. Age of the patients ranged between 25 and 78 (mean 61.14 ± 15.7). The characteristics of the patients such as height, body mass index, history of other disease, and medications were not disclosed and were not a concern in this study. Specimens were preserved in 10% neutral buffered formalin at 4°C until required. The cartilage on the femoral head was visually graded by two independent observers using modified Outerbridge classification (Wright, 2014) (Table 1). A map was designed containing 36 different regions of interests (ROIs) for analysis of cartilage degeneration of vBMD distribution, as shown in Figure 1A. A non-OA femoral head from a 25-year-old patient due DDH was used as reference for comparison. The reason for replacement was DDH but the head did not show any severe cartilage damage. Table 1. Outerbridge classification for grading the degeneration of cartilage. Figure 1. (A) Panel (a) shows the different ROIs, birdview from a left femoral head, and panel (b) shows the scan lines on a right femoral head. (B) Shows the three different scan depths across 6 different regions in group 3, which according to panel (a) are regions 15, 9, 3, 22, 28, and 34. 6 out of 10 slices for this group are shown. The femoral heads were introduced into a pQCT machine (Stratec XCT3000, Germany) to measure the vBMD (mg/cm3). The samples were scanned through six groups which together gave information on all 36 ROIs (Figure 1A) on three different depth levels: outer (0–5 mm), mid (5–10 mm), and inner (10–15 mm), as illustrated in Figure 1B. In total, 108 ROIs per sample were examined. The pQCT scans were analyzed using XCT3000 software (version 6.20, Stratec, Germany), which provided direct data on trabecular vBMD (thereafter referred to as vBMD). The parameters for the pQCT scan were set to 10 slices of 0.1 mm, 0.2 mm voxel size, 180 mg/cm3 threshold and trabecular area of 90%. Therefore, in total 1,080 ROIs per sample were obtained, and the vBMD of these 10 slices were averaged and the mean value was used for each of the 108 analyzed ROIs (Figure 1B). On those femoral head scanned where cysts existed, the cysts were excluded in the ROIs as they are filled with fluid, not bone, and would affect the true vBMD calculations (Figure 2). Figure 2. Presence of a large cyst (white arrows) in an osteoarthritis sample. For cartilage grading, Kruskal–Wallis tests were used to determine any significant differences between OA and non-OA samples. For vBMD, effects of the two factors (cartilage grading and depth/level) and their interactions on vBMD were examined. Data were ranked and aligned as Schapiro–Wilk tests rejected normality and a nonparametric multifactorial test was required. Aligned rank transformation (ART) of data was performed using the ARTool software (Kay and Wobbrock, 2017) available at http://depts.washington.edu/madlab/proj/art/ (Wobbrock et al., 2011). Statistical analysis was then performed on ART data using the SPSS 22 (SPSS Inc., Chicago, IL, USA) full-factorial ANOVA. The data were plotted using OriginPro 2017 (OriginLab, Northampton, MA, USA). Cartilage grading with Outerbridge classification were performed in all 36 ROIs of OA samples. It was observed that the remaining cartilage on the femoral heads are in varying degrees of degeneration (I–IV). Whereas in the non-OA control sample no severe (grade III or IV) cartilage degradation was observed. Overall scoring of the cartilage showed that the cartilage on OA femoral heads have significantly higher score than that of control sample (p < 0.001). Cartilage degeneration pattern in the OA samples are quite different from that of control DDH sample, as demonstrated in Figure 3. Figure 3. Outerbridge scoring (median score) of OA and non-OA samples shows minimal cartilage degeneration in non-OA samples and severe cartilage degeneration in 25% of regions of interest in OA samples. Both cartilage grading and depth had significant effects on vBMD in the OA group (p < 0.001). Within the OA group, there was an inverse relationship between the cartilage grading and vBMD (Figure 4A), meaning that the vBMD decreased with progressively damaged cartilage, which was shown by a weak (r = −0.36), but significant (p < 0.001) Pearson correlation between cartilage damage and vBMD. Statistical analysis confirmed a significant decrease in vBMD with cartilage damage (p < 0.001) with an exception between grade II and III cartilage. Figure 4. (A) Volumetric bone mineral density (vBMD) of osteoarthritis samples according cartilage grading. A significant decrease in vBMD of subchondral bone with cartilage grading was observed at all grades (p < 0.001), except between grade II and III (ns, no significant difference). (B) vBMD according to depth. Mid levels showed significantly lower vBMD compared to outer and inner levels; *p < 0.001. In the outer levels, the subchondral bone adjacent to the grade I cartilage had a vBMD of 423 mg/cm3 (±161); this decreased to 358 mg/cm3 (±157) for the subchondral bone adjacent to the grade II cartilage, and 333 mg/cm3 (±143) for the bone beneath grade III cartilage. Much lower vBMD values, 246 mg/cm3 (±96), was observed for the subchondral bone adjacent to a more severely degraded grade IV cartilage. Also, the depth from the cartilage surface significantly affected the vBMD measurements (p < 0.001), where mid levels showed significantly lower vBMD compared to outer and inner levels, as shown in Figure 4B. The decline in vBMD with cartilage grading was observed not only in the outer level, which is adjacent to the overlying cartilage, but also in mid and inner levels, which are distant to the degenerated cartilage as shown in Figure 5. Figure 5. Volumetric bone mineral density (vBMD) of OA samples according to both cartilage grading and depth. There was a significant interaction between cartilage degeneration and depth (p = 0.003), which means that cartilage degeneration affected vBMD in some levels more than others. In fact, the level with the most change was the outer level (761.01 − 121.54 = 639.47 mg/cm3), followed by the middle level (648.73 − 132.93 = 515.8 mg/cm3) and finally by the inner depth (658.21 − 153.72 = 504.49 mg/cm3) (Figure 6A). This shows that the advanced cartilage damage (grade IV) affects outer levels significantly more than mid and inner layers. Figure 6. 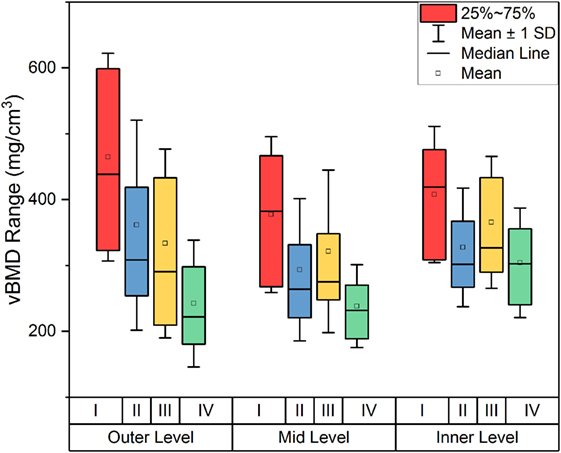 (A) Changes in volumetric bone mineral density (vBMD) of OA femoral heads in outer, mid, and inner levels according to cartilage grading. (B) Outer and inner levels are highlighted (blue and red, respectively) in the femoral head to illustrate the density of each region. Another interesting observation was related to the vBMD surrounding the subchondral bone cysts. These subchondral bone cysts were present in all of OA cases and areas surrounding the cysts showed a significantly higher vBMD (894.8 ± 64 mg/cm3) compared to the neighboring sites (Figure 2). We investigated the effects of cartilage degeneration in the OA joints on subchondral vBMD both locally and distantly to the overlying cartilage, as well as the association of vBMD in OA subchondral bone with the degree of damage in the articular cartilage as assessed through pQCT. We observed that degradation of cartilage in the OA joints had a significant effect on vBMD distribution in the subchondral bone. In the layer adjacent to the overlying cartilage, the vBMD decreased significantly with cartilage degeneration (Figure 5). This could be explained by the fact that cartilage damage induced by OA can lead to increased bone remodeling as a result of changes in the loading regime. This may lead to excessive bone turnover, increased bone fraction, and decreased levels of mineralization (Grynpas et al., 1991; Fazzalari and Parkinson, 1997; Stewart et al., 1999; Cox et al., 2012; Yu et al., 2016), all leading to a decreased vBMD. However, the literature is not conclusive on the effects of OA pathology on trabecular density (Karvonen et al., 1998). A study by Dore et al. (2010) suggested that subchondral BMD could not predict cartilage loss, while other studies on OA joints claimed that there is no association between changes in OA grade and changes in BMD (Muehleman et al., 2002; Haugen et al., 2007; Abdin-Mohamed et al., 2009). Nevertheless, we observed a decreased subchondral vBMD with a pattern that associates with zones of damage in articular cartilage, indicating that the subchondral trabecular vBMD declines with increasing OA pathology, which was shown by the negative correlation of vBMD with Outerbridge Cartilage Scale grade as demonstrated in Figure 4A. This may show the potential of using pQCT for detection of early OA based on changes in vBMD; based on our results, with progression of OA, for example from grade I to grade II, a significant decrease is detectable by pQCT. A search in the literature would hint to conflicting results regarding BMD changes with OA. While studying patients affected by OA, some researchers have discovered higher BMD in the joints, while others have not observed the same effects (Sandini et al., 2005). Sandini et al. looked at femoral BMD in subjects with OA and although they found increased bone mineral content and bone size, they did not observe higher BMD in those subjects. This was also accompanied by a faster BMD loss compared with healthy controls. Conversely, Lee et al. (2016) observed that hand and knee OA were negatively associated with the BMDs of the lumbar spine and femoral neck. These controversies surrounding the relationship between BMD and OA may be explained by the following factors: differences in the measurement methods and differences in the measurement sites. One must note the difference between vBMD and BMD; the former is a volumetric measurement determined using QCT methods such as pQCT, while the latter is an areal measurement quantified using methods such as DXA. DXA provides a reliable evaluation of areal bone density but is incapable of distinguishing between cortical and trabecular bone (the parameter measured and discussed in this article) or take into account changes in the bone size, which may overestimate the resultant BMD, whereas pQCT can provide accurate measurements of true vBMD and can supply isolated measurement of cortical and trabecular bones (Abdin-Mohamed et al., 2009). As such, although radiographic OA of the knee is known to be connected to elevated areal BMD at the hip and spine, the vBMD of tibia was not increased in patients with knee OA (Lee et al., 2016). Another important factor which may cause confusion when comparing BMD/vBMD data across different studies is the measurement site (i.e., systemic, distal, or local measurements). For example, Lee et al. showed that BMD loss, measured at a distant site, is associated with progressive loss of cartilage in knees with OA, confirming what was observed by Zhang et al. (2000) that again BMD loss is linked with deterioration of the joint shown by radiographic joint space narrowing. Changes in BMD with OA may differ in different joints. 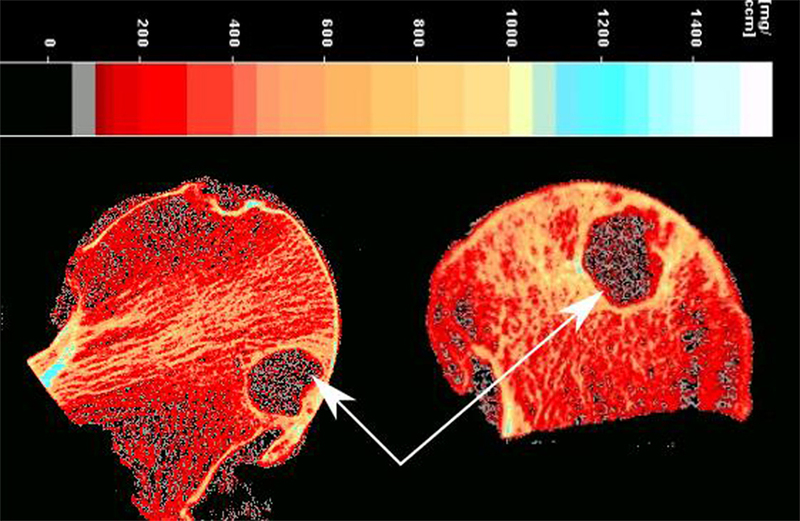 For example, using Raman Spectroscopy it has been shown that the subchondral bone from OA hip joints can have reduced mineral-to-collagen ratio (decreased vBMD), whereas subchondral bone from OA knee joints can have increased mineral-to-collagen ratio (increased vBMD) (Buckley et al., 2014). The results from our study suggest that vBMD is highest in the outer layer of the trabecular bone, followed by the inner layer, and finally the mid layer as demonstrated in Figure 5B. The outer layer includes the cortical subchondral bone plate which may explain the highest vBMD. The fact that inner layers showed higher vBMD compared to mid layer may be explained according to the trabecular patterns observed by Wolff’s Law, where the inner layer in our study coincides with the denser region of where principal compressive and tensile trabecular groups meet as shown in Figure 6B. The level which experienced the most change with increasing OA grade of the cartilage was the outer level, as shown in Figure 6A, suggesting that the outer layer is the most affected one by the cartilage degeneration in the OA joints and the core in the femoral head was the one least affected. This is possibly because OA pathology related changes such as cysts or microcracks occur much more on the surface than in deeper layers. In fact, two studies performed on OA patellae and tibial plateaus in different depths showed similar results and found that the least dense layer was the internal layer (Burnett et al., 2016) and deeper trabecular bone layers have decreased vBMD compared to the surface (Johnston et al., 2011). We observed subchondral bone cysts in all of OA samples, which are consistent with other reports on OA hip (Chiba et al., 2014). These fluid-filled voids in subchondral bone, which are typically referred to as “subchondral bone cysts,” are normally reported in OA patients. There are two main theories about the source of subchondral bone cysts in OA. The “synovial fluid intrusion” theory suggests that due to cracks in the osteochondral region, synovial fluid enters into subchondral bone and leads to development of these cysts; while the “bone contusion” theory proposes that the necrotic lesions in subchondral bone, generated by abnormal mechanical stress result in microcracks, edema, focal bone resorption, and subsequent cyst formation (Li et al., 2013). Our study showed that the vBMD of the subchondral bone surrounding the cysts are significantly higher than the neighboring areas, indicating possible bone remodeling as a result of cyst formation. Increased local BMD has also been previously associated with bone marrow lesions in patients with knee OA (Lo et al., 2005), showing a positive relationship between loading and BMD as the response of bone to local stresses. Further studies in the field could increase the understanding of OA pathogenesis and facilitate the development of new and improved treatments, possibly using pQCT techniques. The local changes in subchondral vBMD with OA were assessed in OA femoral head using pQCT. We observed a negative association between local vBMD and severity of cartilage damages, especially in outer layers of subchondral bone, which we believe is linked to the changes in subchondral bone remodeling. PQCT was able to detect significant changes in vBMD between areas of different cartilage degeneration score, which points to its potential as a technique for detection of early OA. All procedures performed in this study involving human participants were approved by the ethical standards of NHS Health Research Authority, London—City & East Research Ethics Committee (REC reference: 15/LO/2052) and were in accordance with the 1964 Helsinki declaration and its later amendments or comparable ethical standards. Also written informed consent was obtained from all individual participants included in the study. MT contributed to the experimental work and prepared the manuscript; SC and LV conducted the experimental work and contributed to drafting the manuscript; AH, ME-H, and JH collected the samples; CL designed the study and contributed to editing of the manuscript. All authors reviewed the paper critically for intellectual content and approved the final version. All authors agreed to be accountable for all aspects of the work in ensuring that questions related to the accuracy or integrity of any part of the work are appropriately investigated and resolved. This work was financially supported by The Arthritis Research UK Proof of Concept Award (grant no: 21160) and Rosetrees Trust (project no: A1184). Karvonen, R. L., Miller, P. R., Nelson, D. A., Granda, J. L., and Fernandez-Madrid, F. (1998). Periarticular osteoporosis in osteoarthritis of the knee. J. Rheumatol. 25, 2187–2194. Kay, M., and Wobbrock, J. (2017). ARTool: Aligned Rank Transform for Nonparametric Factorial ANOVAs. Version 1.6.2. Sandini, L., Arokoski, J. P. A., Jurvelin, J. S., and Kröger, H. (2005). Increased bone mineral content but not bone mineral density in the hip in surgically treated knee and hip osteoarthritis. J. Rheumatol. 32, 1951–1957. Stewart, A., Black, A., Robins, S. P., and Reid, D. M. (1999). Bone density and bone turnover in patients with osteoarthritis and osteoporosis. J. Rheumatol. 26, 622–626. Wobbrock, J. O., Findlater, L., Gergle, D., and Higgins, J. J. (2011). “The aligned rank transform for nonparametric factorial analyses using only ANOVA procedures,” in Proceedings of the ACM Conference on Human Factors in Computing Systems (CHI ’11). Vancouver, British Columbia. New York: ACM Press, 143–146. Yu, D., Xu, J., Liu, F., Wang, X., Mao, Y., and Zhu, Z. (2016). Subchondral bone changes and the impacts on joint pain and articular cartilage degeneration in osteoarthritis. Clin. Exp. Rheumatol. 34, 929–934. Zhang, Y., Hannan, M. T., Chaisson, C. E., McAlindon, T. E., Evans, S. R., Aliabadi, P., et al. (2000). Bone mineral density and risk of incident and progressive radiographic knee osteoarthritis in women: the Framingham Study. J. Rheumatol. 27, 1032–1037. Copyright: © 2017 Tamaddon, Chen, Vanaclocha, Hart, El-Husseiny, Henckel and Liu. This is an open-access article distributed under the terms of the Creative Commons Attribution License (CC BY). The use, distribution or reproduction in other forums is permitted, provided the original author(s) or licensor are credited and that the original publication in this journal is cited, in accordance with accepted academic practice. No use, distribution or reproduction is permitted which does not comply with these terms.